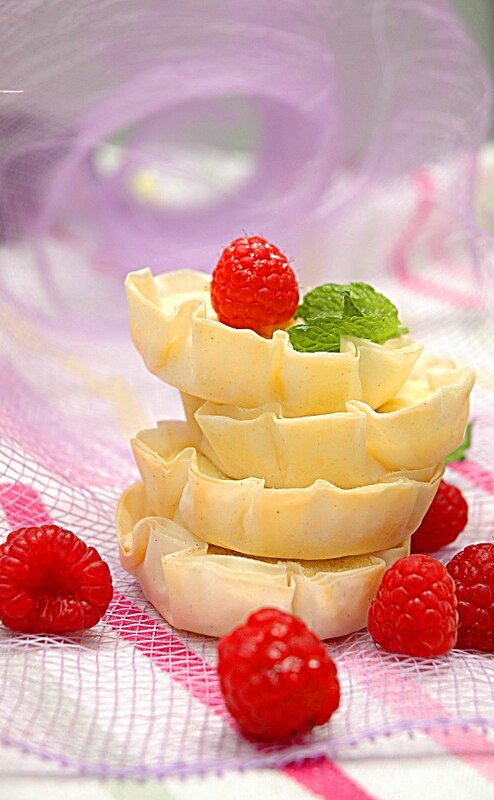 1/2 of a 17.3-ounce package puff pastry Sheets (1 sheet), thawed, 1 egg, beaten, 1/2 of an 8-ounce package cream cheese, softened, 1/2 cup prepared lemon curd, 1/2 cup thawed frozen whipped topping, Fresh raspberry or blueberries. Heat the oven to 375°F. Lightly grease 36 (1 1/2-inch) mini muffin-pan cups. Unfold 1 pastry sheet on a lightly floured surface. Roll the pastry sheet into a 12-inch square. Cut into 36 (2-inch) squares. Press the pastry squares into the muffin-pan cups. Brush the top edges of the pastry squares with the egg. Prick the centers of the pastries with a fork. Bake for 10 minutes or until the pastries are golden brown. Using the back of a spoon, press down the centers of the hot pastries to make an indentation. Let the pastries cool in the pans on wire racks for 10 minutes. Remove the pastry cups from the pans and let cool completely on wire racks. Beat the cream cheese in a medium bowl with an electric mixer on medium speed until smooth. Beat in the lemon curd. Fold in the whipped topping. Pipe or spoon about 1 teaspoon cheese mixture into each pastry cup. Refrigerate for 10 minutes or until the set. Top each tart with 1 raspberry.